No matter what. We have news everywhere on Sify and Rediff. Aana Dinamalarla paarkara maadhiri varuma ? 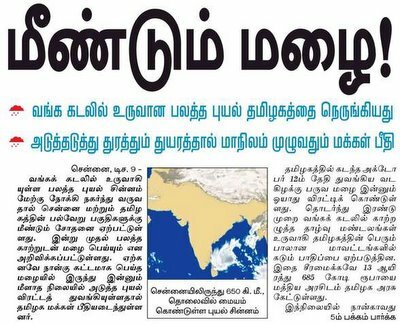 Here's Dinamalar offering ePaper. It is classic and free. So grab it now. News, in the way it is on paper (including advertisements). Now this is interesting. Here's another link - Check this song. MS Viswanathan and SPB. I've never heard this song before. Thanks to Narayanan for introducing me this song. Chennai is now expecting a heavy rain. Atleast the meteorological department guesses it. See to yourself how it looks like now. rain started alread, god should save the chennai. I never knew there were named cyclones in India. A little google and I ended up here.